Flying out the Geneva Motor Show is a car that can go places most can’t, because it flies. The 8.5-foot long monocoque carbon-fibre passenger pod is built and on show at the car event right now - but it’s just a concept. The flying car concept was created by Airbus with Italdesign. Since the former is a real flying vehicle manufacturer this shows it’s not only looking into this kind of tech but could start work on it soon. 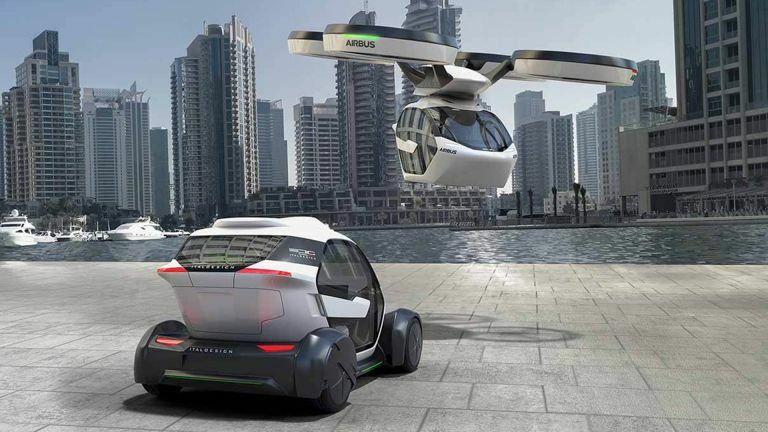 The Pop.Up System, as the concept is called, features a helicopter blade powered pod for flight which docks into a four wheel frame for road driving. All that and it is autonomous not only driving itself but flying itself too. The vehicle will work a bit like an Uber service where users don’t own the vehicle but simply call them when needed, using an app. Airbus has even said this flying pod could work in conjunction with future Hyperloop train systems to offer the best possible combination of transportation modes for the quickest journey. When this concept becomes a reality is another matter. We haven’t even managed to get self-driving cars legally on the roads yet so entrusting machines to fly us too is a big step. Although it’s very possible and will likely become a reality far sooner than we think once autonomous driving becomes the norm. Watch the skies.